Some girls get flowers and chocolate from their significant other. It was a sweet and thoughtful gesture from Handy Husband. And I say that with the utmost degree of sincerity, not sarcasm. Sometimes I need to clarify these things. This isn’t my first almond rodeo. I know a package of healthy unsalted almonds when I see one. In other words, no salt. No roasting. Nothing added. 100% raw almonds. 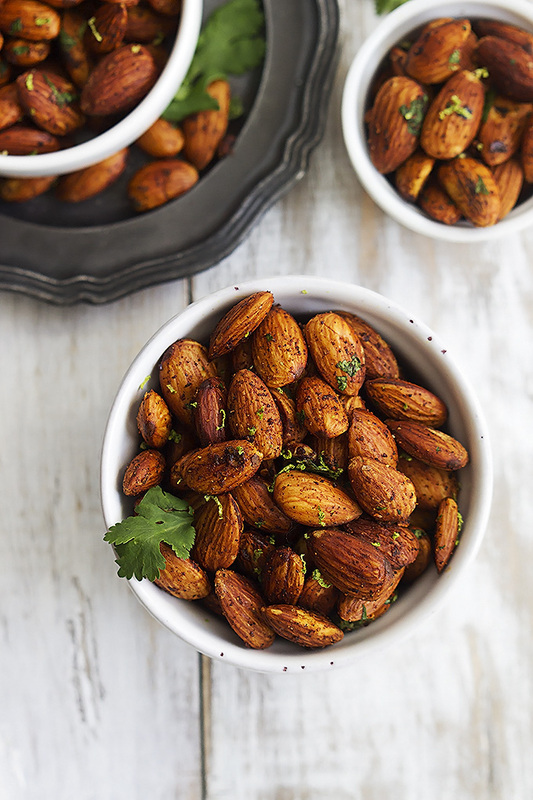 Clearly, there are several good reasons for not roasting and salting almonds. Health reasons. Baking reasons. Um…taste preference reasons? I do enjoy raw almonds from time to time, but I enjoy salted almonds more. So I decided to experiment with the almonds. And by experiment I mean google a recipe. This is not a cooking blog, after all. This is more of a ‘diary of what I eat and a bunch of other random stuff’ blog. The recipe that jumped out at me was a 10-Minute Chili Lime Almond recipe by Creme de la Crumb. Isn’t that a great website name? And don’t these almonds look delicious? Of course I had to make them! Limes and chili powder are kitchen staples in our house, so this recipe seemed like fate. And I can spare 10 minutes to make a snack! After all, I did spend 10 minutes waiting for a kid to tie their shoes this morning. Could have lost my sanity made a batch of almonds in that amount of time! Push them around for about 5 minutes and you’re done! 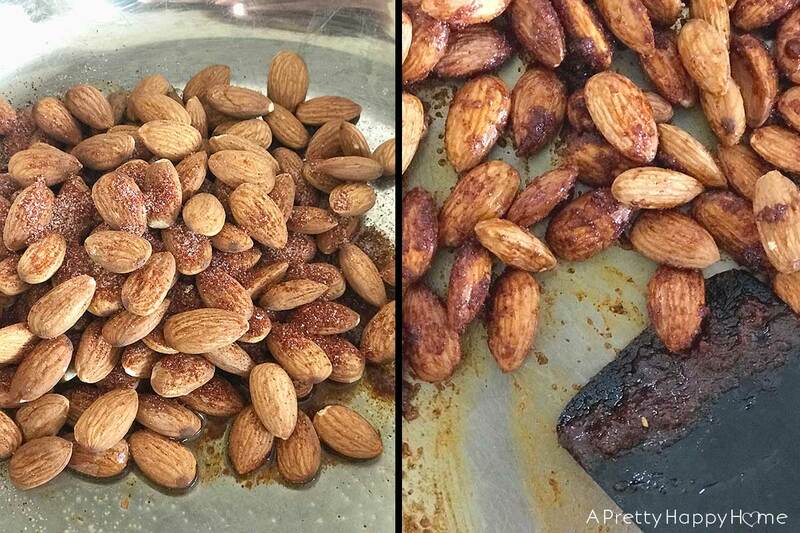 I tried one of the almonds while it was still warm and I was worried I hadn’t cooked them long enough. However, once the almonds fully cooled, they had a crunch. Not as much crunch as you’d expect from a roasted almond, but perhaps if I had cooked them a minute longer they would have. I’m just throwing out guesses, folks. We’ve established I’m not an expert, right? Phew. You’ll notice there was one ingredient in the original picture that I did not add to my recipe – fresh cilantro. The reason why I didn’t add it was two-fold. First, I really just wanted to experience the flavor of the lime and chili without the cilantro distraction. Second, if these didn’t get eaten right away, I thought it would be weird to have bits of cilantro hanging around on the almonds. 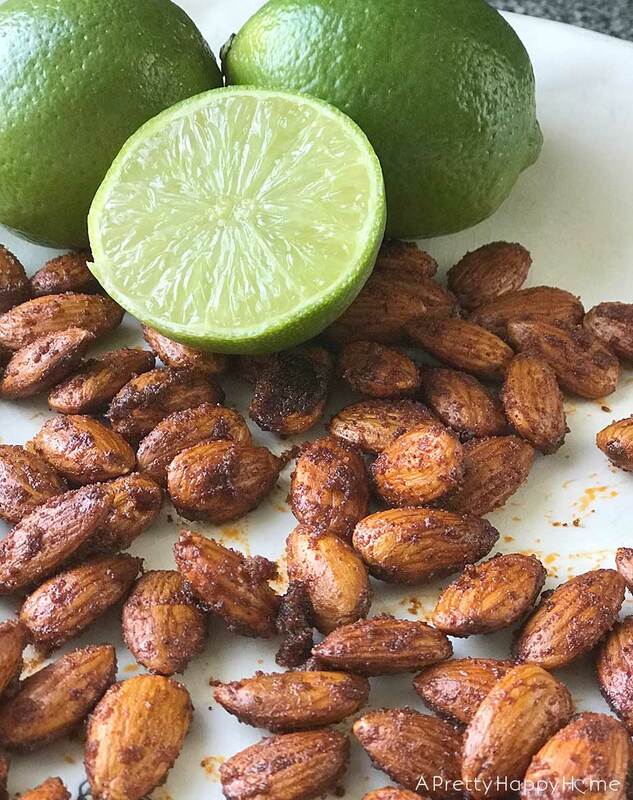 Would I make this Chile Lime Almond recipe again? I’m sitting on the fence, guys! I can’t decide yet. That’s not a satisfying answer, I know. The reason I’m on the fence is the almonds did end up in our cupboard for about a week. So, basically, we ate them with restraint, as one should do when it comes to all things snack-related. I don’t want to knock the recipe though because to be fair, I did not add the cilantro. That could have been a game changer. Also, the recipe said to use 1 – 2 teaspoons of chile powder and, of course, I erred on the side of more chile powder. It’s what I do! In this case, it was a bit much for me, so I’d do closer to 1 teaspoon if I made the recipe again. 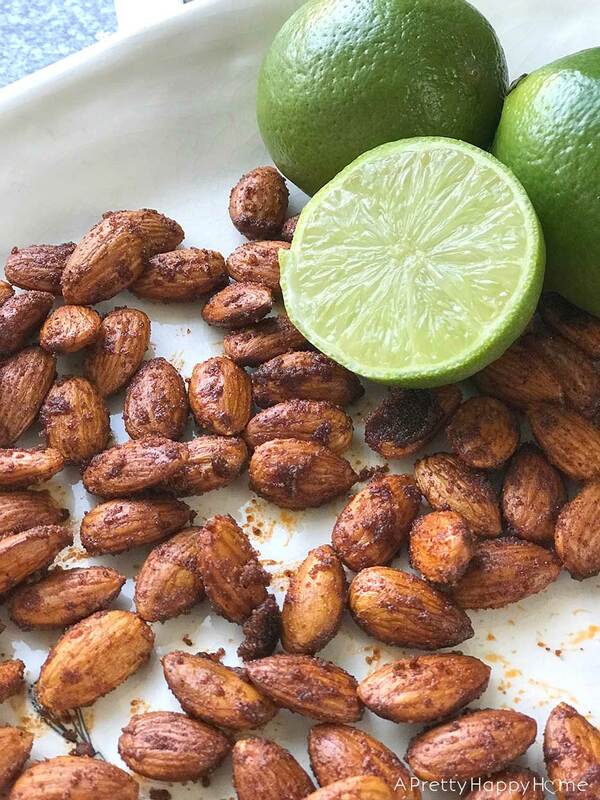 I think the Chile Lime Almonds has potential to be a great addition to your go-to list of party food snacks. You know, if you follow the recipe and don’t be like me. Most of all, I’m happy this recipe pushed me out of my comfort zone and prompted me to try something new. That, in and of itself, made the entire experience well worth it! The next time Handy Husband brings me a bag of unsalted almonds, I’ll be ready to give this another go!